Not only is Flo's Place in Murrells Inlet a roaring good time, the people are all extremely friendly, and the food is picture-perfect -- and absolutely delicious. 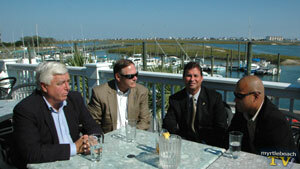 On the deck of Spud's Waterfront Dining in Murrells Inlet, political consultant Tom Herron, Senator Ray Cleary, Surfside Councilman Bill McKown, and myrtle beach TV's Scott Perez discuss leadership and various local and regional issues, for segments airing in episodes 21 and 22 on the show. 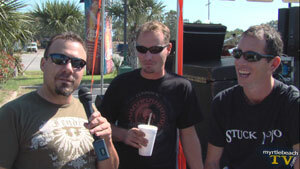 The talented Gogglez Pizano trio interview behind the outdoor stage at Dagwood's Deli & Sports Bar in Surfside during the annual Oktorberfest celebration. 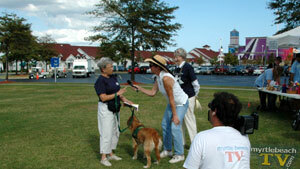 Scott Perez talks with McGruff the Crime Dog at the 2007 Heart Walk at Broadway at the Beach. 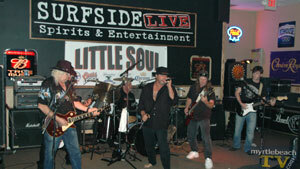 Pro-circuit southern rock band Little Soul takes the stage for three nights during bike week at Surfside Live, rocking the club and myrtle beach TV for several hours. 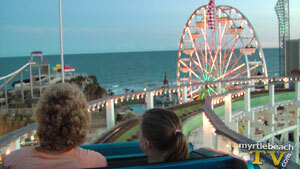 Immediately following the Myrtle Beach Chamber Business After Hours, myrtle beach TV jumps on the oceanfront rollercoaster at Family Kingdom Amusement Park. Cathy Honeycut of FOX TV talks with Mrs. Davis and Lila at Band-Aid for Autism at Broadway at the Beach. After all walkers finished the final miles of the inaugural Sara's Beach Walk, Hard Rock Park's CEO Steven Goodwin thanks participants and invites them to a concert, featuring several top bands, and a celebration at the park. 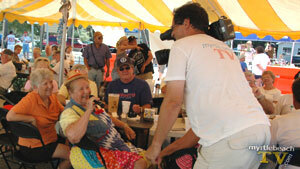 Known as "Miss Calabash" myrtle beach TV talked with Rita, a native of Germany currently living in Calabash, NC, and others during a successful 2nd Annual Octoberfest in Little River. With great food and fun enjoyed by all, Pat and Mike's Irish Pub on Highway 17 in Little River was host of a recent monthly Little River Chamber of Commerce Business After Hours. 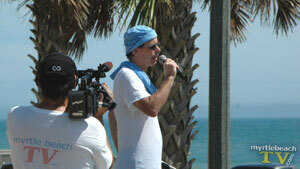 While there, myrtle beach TV interviewed several business owners and taped upcoming segments for the series. Local radio personality Prez of Wave 104.1 and master control supervisor Daz of FOX TV were among the many guests at the first anniversary birthday party of the Weekly Surge at Club Boca in Celebrity Square. Airing in an upcoming episode, myrtle beach TV talked with the two of them during the behind-the-scenes taping of the celebration. 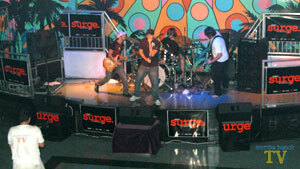 Popular Myrtle Beach band Not Yet Rated takes the stage at Club Boca for Weeky Surge's first anniversary party. 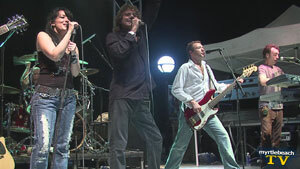 The band has considerable energy, which isn't surprising since the oldest of the four members is only 21. 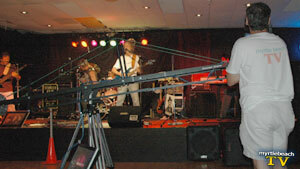 What is surprising is the amount of talent and skill these young musicians possess. Do NOT miss a chance to see these guys perform! 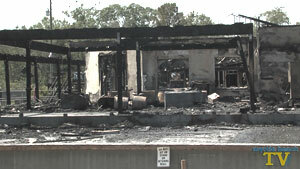 The morning after we filmed the Sanson Brothers at HB Spokes, a fire destroyed the popular local club. Warren returned to HB Spokes the next morning to talk with the owner, who says he'll rebuild and plans to have the club kickin' for a New Years Eve bash. 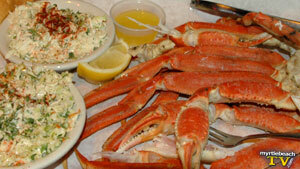 He will also, he said, using tents and outside bars, be open for Fall Bike Week. 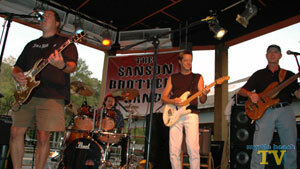 For a three-day stretch, the Sanson Brothers rock the outdoor stage at HB Spokes on Highway 9. After their final set, one of the guys in the audience enjoyed their music so much he handed them a pile of cash and asked them to play another 30 minutes. 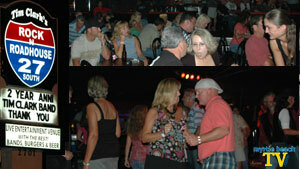 Celebrating both the 2nd Anniversary of Tim Clark's Rock-n-Roadhouse and the sale of the business, the Tim Clark Band played at the venue for a final time to a packed crowd, taking time between sets to thank the people who've been important in his life and his business. With the sixth (previously missing) Sick Stooge present this time, myrtle beach TV captures the Sick Stooges at The Venue in North Myrtle Beach. 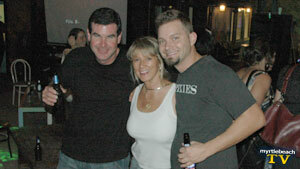 Two of the Old Scobes and Marcia in between sets at Pirates Cove in North Myrtle Beach. Starship with Mickey Thomas performed (after the rain let up) at the BOB FM 1st Birthday Party at Broadway at the Beach, sponsored by BOB FM, FOX Myrtle Beach, Bud Light, and Celebrity Square Clubs. 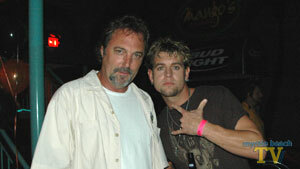 Myrtle Beach TV shoots Nathan Utz of 80 Proof at The Clubhouse in Myrtle Beach. 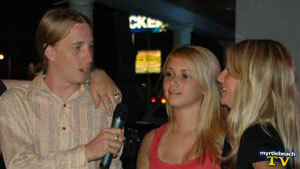 Cathy Honeycutt interviews contestants at the Carolina Idol final competition at Karma Teen Nightclub in downtown Myrtle Beach. Greg and Alix laugh at Marcia Lynn's "Granny Glasses"
Greg Rowles, Marcia Lynn, and Alix Michaels on the set of Not The News at FOX studio. Warren interviews Jennifer of Weekly Surge and shoots a behind the scenes at one of Surge's Party Pix at Overtime Sports Cafe in North Myrtle Beach. 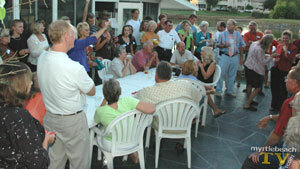 Myrtle Beach TV shoots outside of Tequila Mockingbird in Murrells Inlet. 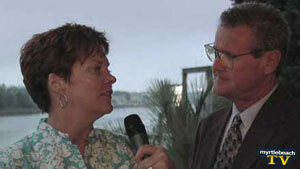 Warren and Marcia Lynn on location at Greg Normans Australian Grille. 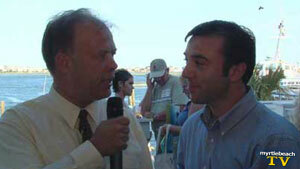 John Zilinsky and Kevin Krawchuk at Spud's Waterfront Restaurant in Murrells Inlet. Cathy and Bill talk about helping local animals. Cathy Honeycutt and Bill Norman at Dynamites at Dock Holidays. 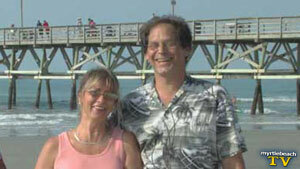 Warren and Marcia Lynn on location at the Cherry Grove Pier.